This post was sponsored by HomeZada. The opinions expressed are solely my own, based on my personal experience using this product. We’re half-way through National Preparedness Month. Hopefully, you’ve been able to devote some time to ensuring that your household is properly set up to weather a natural disaster (no pun intended) and/or emergency situation. Part 1 and part 2 of the Organizing for an Emergency series focused on protecting your vital documents. 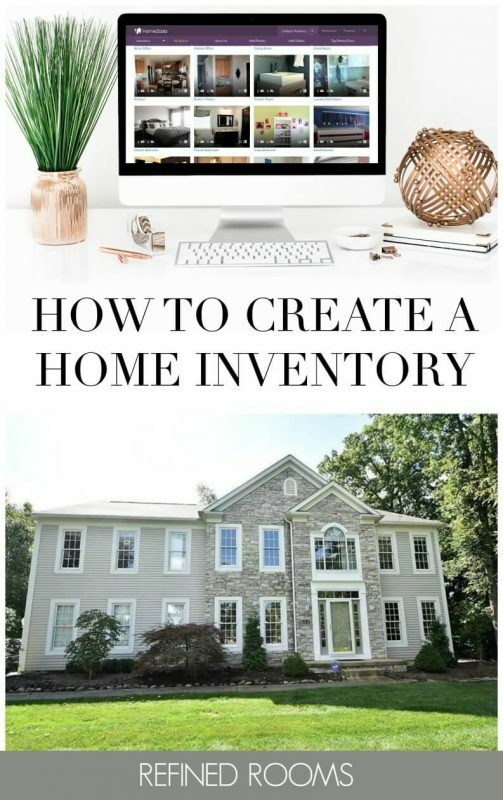 Today, I’ll wrap up the three-part series by outlining a step-by-step process for creating a home inventory using one of my favorite tools for organizing home-related information. I was introduced to the HomeZada digital home management tool at the 2014 National Association of Professional Organizers (NAPO) Conference. I was immediately smitten with this product and could not wait to explore all of its many features. I’ve been using it over the past year to manage our household maintenance tasks and our home improvement projects. Creating an inventory of our home’s fixed assets and possessions has been on my long term “to do” list for many years. Despite knowing how reeeaaalllyy important it is, I’ve hesitated to take the project on since I figured it would be time-consuming and overwhelming (can you relate?). When I began to explore HomeZada‘s home inventory module, my anxiety about this project began to fade away and I set a goal to complete our home inventory by the end of this year’s National Preparedness Month. Some of you may be wondering why creating a home inventory is necessary. Simply put, it’s the best way of documenting proof of ownership in the event of a disaster or burglary. I’ve had conversations with many people who have had to endure the painful process of creating an inventory from memory after their house has burned to the ground or damaged by a hurricane. Try to recollect from memory every single item you own. Do you think you may forget a few things in the process? The simple truth is that you will fare significantly better during the insurance claim process armed with detailed documentation of what you own. In addition to assisting with the insurance claims process, creating a comprehensive inventory of your possessions can be very helpful in your estate planning process, as well as determining if you are properly insured. Need more reasons? Here’s 33 of them, and 5 more! There’s so much to love about this digital home management tool. Let’s start with the cost…free! 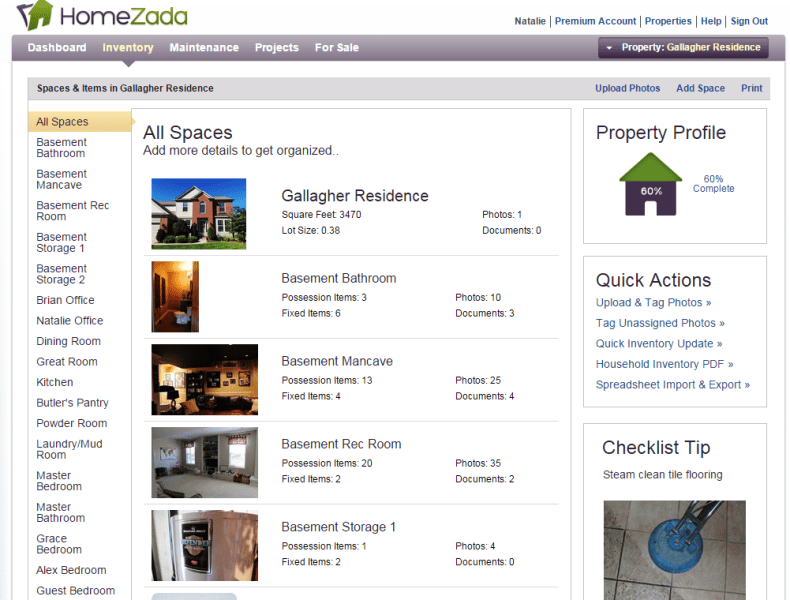 The home inventory module is part of the free Essentials version of HomeZada. I’ve chosen to upgrade to the Premium version in order to take advantage of the home maintenance and improvement modules. I love that all of the information about my home is contained in a single place, and that I can access the information from anywhere, either via their website portal or the HomeZada app that I have installed on all of my mobile devices. Can you create a home inventory without fancy software? Sure. You could use trusty ol’ paper and pencil or even a simple spreadsheet to track your possessions. For me, the primary advantage of using HomeZada over these other traditional methods is its built-in time-saving features. For example, when you begin with a new space, instead of starting from scratch with a blank legal pad, you begin by modifying a room that has already been pre-populated with items typically found in that room category. Let’s demonstrate with an example. When it was time to begin documenting the contents of my daughter’s room, I used a “bedroom” template to create this space, which automatically included items such as: bed frame, clothing, bedding, accessories, computer, etc. The set of pre-populated items serves as a useful prompt for me to remember items that I may not have thought to include. For items that are not applicable, I simply delete the item (e.g., my daughter’s computer is not stored in her bedroom). HomeZada provides the framework; all I need to do is to “fill in the blanks”, which makes it a much less overwhelming task. Similarly, HomeZada creates a pre-populated template of rooms when you first enter details regarding the size of your home. Starting with a template that you merely need to modify with a few mouse clicks is significantly more efficient than having to enter all of the room data from scratch. Don’t know about you, but I’m all about efficiency! You can either use a camera, and then upload images onto your computer, or take photos and upload via the HomeZada app on your mobile device. I chose to use my camera and then upload the images onto my computer so that I would have a “local” backup copy of the images on my computer hard drive. Take wide-angle shots from each corner of the room, as well as a shot of the ceiling and the floor (in order to document the flooring, ceiling, and lighting for each space). You’ll also want to take individual photos of “high ticket items”. My definition of a high ticket item is anything that costs $100 or more. For these items, take a close-up shot of the model/serial number if it is displayed on the item. You may want to consider taking photos of item groupings, such as clothing, books, DVD collections, etc. Use a document scanner (here’s the one I use) or a scanning app such as Genius Scan in order to digitize receipts that you have for those “big ticket” items. Create a folder on your computer in which to file those receipts. 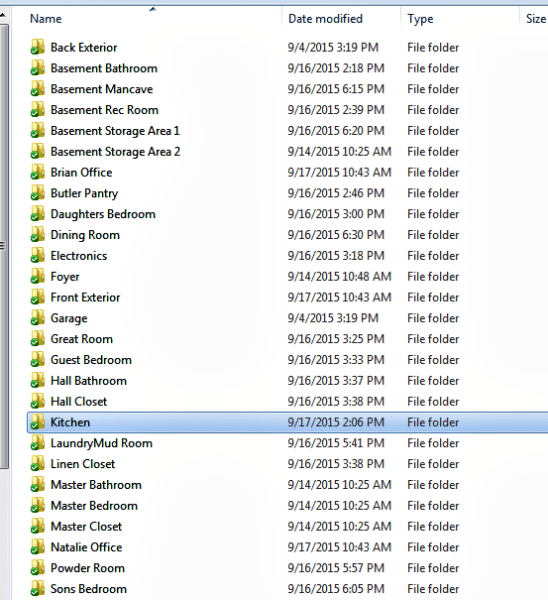 Depending on how many you have, you may want to create subfolders for each space. Within HomeZada, modify the initial spaces template so that it accurately reflects your property. For example, I changed the original names of the bedrooms (“Bedroom 1” & “Bedroom 2”) to “Grace’s Bedroom” and “Alex’s Bedroom“, eliminated a room called Nook (since we don’t have a breakfast nook), added a second home office, as well as a butler’s pantry and a basement man cave. Once you’ve modified this initial template, you simply need to “fill in the blanks” from this point forward. 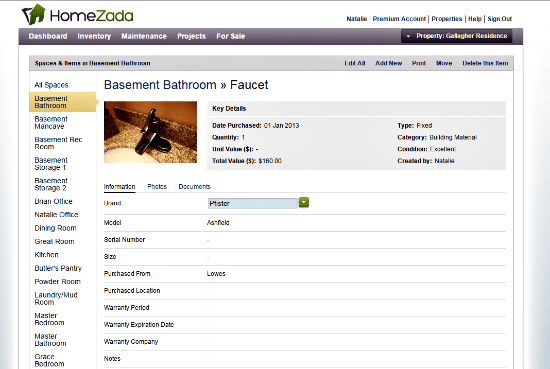 There’s a number of different ways to populate the inventory database in HomeZada. The most efficient way to do it is by using the “Upload and Tag Photos” feature in the Quick Actions box on the dashboard. Once you’ve uploaded your hundreds of photos, you’ll then need to spend a chunk of time performing some mindless data entry…a great task to accomplish during a few late-night Netflix binge sessions! Once you’ve uploaded and tagged your photos, you can then move onto uploading your digital receipts for the Big Ticket items. As you can see below, HomeZada provides the opportunity to capture oodles of info for each item in your inventory, yet doesn’t require any of it. You can choose to include as much or as little detailed information for your items as you’d like. It’s very likely that you simply don’t have receipts for many of your items, so you’ll have to provide an educated guess regarding the purchase date and/or purchase cost. If you purchased an item via an online retailer such as Amazon, you may be able to login to your account and download a copy of your order, which can serve as a receipt. You may simply choose to omit the information, knowing that you’ve at least accounted for the item in your database and have a photo to document ownership. This is far better than no documentation at all! Create a Household Inventory PDF document by selecting this option within the Quick Actions Box located in the Inventory Module. 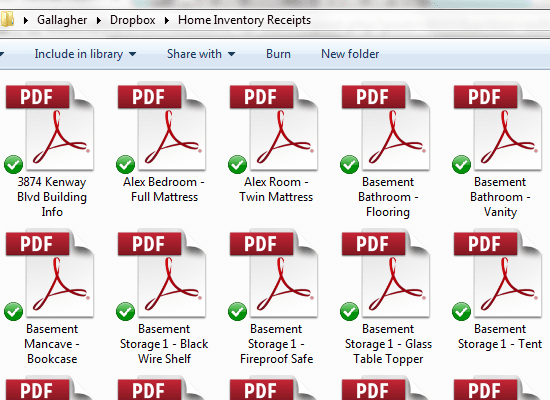 Store a printed copy in your fireproof safe, and a digital copy in your cloud document storage account. While you’re at it, send a digital copy to your insurance agent to have on file as well. As you can imagine, your home inventory is a dynamic document. New items are constantly flowing into your home, and old, obsolete, broken, and no-longer-wanted items are always flowing out. Given this fact of life, it’s important to periodically revisit your inventory. A good rule of thumb is to review and update it once a year at a consistent time (e.g., in early January). It’s also a good idea to update your home inventory any time you complete a home renovation project and/or make a major household purchase. So whose ready to tackle their home inventory? I have to share this post with my husband. We really has wished we had done this after a hurricane. Thanks for the reminder. I’ve heard it is good to do a home inventory (and price for the said items) if you have have an earthquake, theaft or fire! Never heard of a program to store it. Great idea! I love this idea! I will definitely be checking it out so that we have options should anything happen! Thank you for the heads up. This is a very helpful post that I am going to bookmark. I really need to prepare for an emergency as thats been on my to do list forever! I would love to use something like this for my own home – it is very important to have a record of your belongings. My parents had a house fire and had to do an inventory after a traumatic experience and while everything was burnt up and in disrepair. I love that pie graph for the possessions by type! Pinning this for later! Home Zada sounds awesome and a lot better than the chicken scratch notebook I have that would be useless in an emergency like a fire! Oh Cher, you made me laugh! Thanks for stopping by! This is definitely something I need to consider. You never know what could happen and this is a great way to keep track of your things. Thanks for sharing. Thanks for stopping by Pamela! 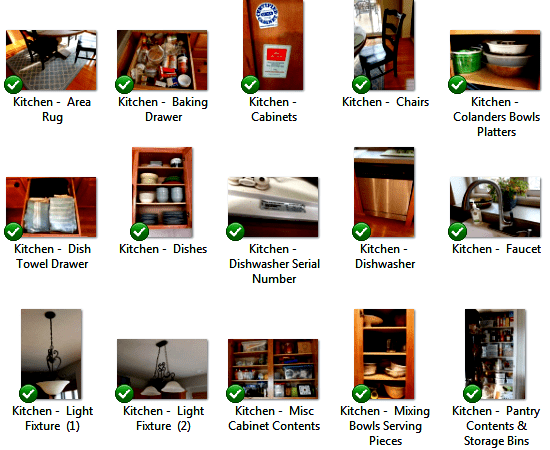 I seriously need to get my home inventory organized and documented. I don’t think i have any pictures unless they are in the back of selfies or pictures of my pets. LOL! Yes, dust off that camera and get cracking MsCrookedHalo! Very helpful. This is definitely something that I need to consider more for my own household. I’m so glad that you found the post helpful Tanya! Wow, I’ve actually been looking for ideas about how to do home inventories and have it on my fall to do list. I hadn’t even thought that there would be a program like this. I’ll definitely have to check it out! Thanks! Wow, great timing Kari! You will be so glad that you tackled this organization task. The peace of mind it gives you is amazing. Best of luck! Wow! This is something I’ve never heard of before. 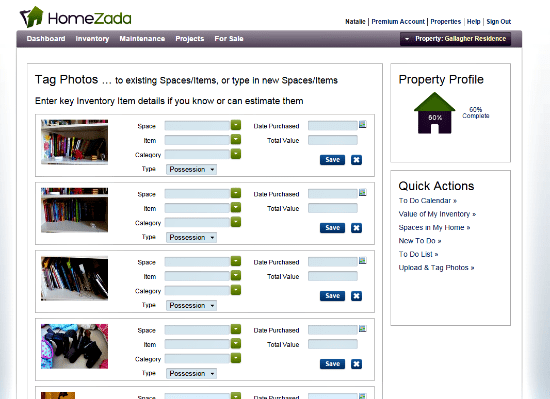 I’ve known about keeping an inventory – but Homezada sure sounds like the way to go. I’ll be researching this more. Thank you so much for sharing! You’re welcome Brooke. Thanks for stopping by! I’ve never thought of this before. Doing a home inventory seems a great idea. It seems pretty easy to organise using this app. Yes, it would be a much more daunting task without the HomeZada tool; I’m happy to spread the word about it! I’m glad you found this post useful Karen. Thanks for sharing! Awesome Karen, another Happy HomeZada customer! Thanks for the information. This is definitely something I need to think about. You’re welcome Jeryl. Thanks for visiting! I will definitely be looking into this. It looks like this will drastically reduce the stress of inventorying the home. As you stated, it is stressful enough to inventory your home any time. I cannot imagine doing it after a disaster. It is better to be proactive. I have never heard of this site. Thank you for sharing. Yes being proactive is key. Your future self will thank you! HomeZada would be great for you as a new homeowner, both for the home inventory functionality, as well as the home maintenance/home improvement project management aspects. Congrats on the new home! Yes this is a thing. i did this the old fashion way with my Longaberger baskets. i took pictures of every single one. I’m glad to see there is software available now! It’s especially important to inventory valuable collections! Thanks for stopping by Erica! Preparedness is essential for all homes and this is very useful information. 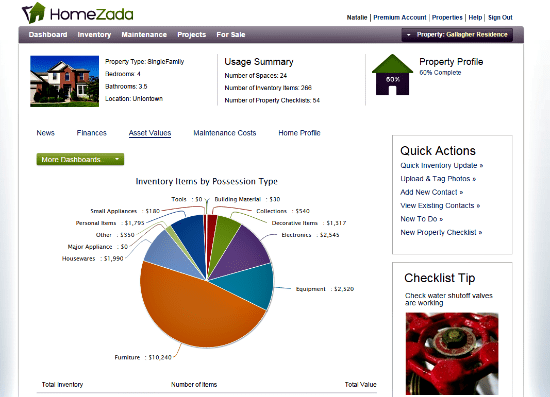 The resources available with Homezada are so thorough and comprehensive. It is great to take time to invest in the safety of your family, personal information and belongings. I couldn’t agree more! Sometimes, the tasks that are most important get put on the back burner because they are aversive to complete. I can honestly say that Homemade made the home inventory process fun! Wow! A home inventory is a great idea. I’ve never thought of doing one before, so it would probably take me a long time. However, this looks to make it a lot easier. I look forward to seeing yours when it is complete. It does require an investment of time up-front, but once you’ve done it, it’s just a matter of maintaining it from year to year, which is easy with HomeZada. I’m actually putting the finishing touches on mine this week, and hope to be 100% done by next week. Thanks for checking in with me! Wow, I can only dream of being that organized. I’m very much a clutter bug, though it drives me crazy. This is a great app and looks so helpful. I need to be more prepared. You don’t have to dream. You just need some motivation, a bit of education, and the right tools to tackle the job. I’ve given you the blueprint in this post, and recommend HomeZada as the tool. Just muster up the motivation, set aside the time, and you’ll be all set! Thanks for stopping by! Another good reason to keep a home inventory is in case of bankruptcy – they’ll ask you for an inventory of everything in your home (I’ve had 2 friends go through bankruptcy and they had to give a home inventory). Not a pleasant thing to think about either, but it does happen, even to the best of us and the most careful with their finances. Oh my goodness Charity, I wasn’t aware that it was a requirement for bankruptcy. Yes, bankruptcy is stressful enough; I would not want to have to complete a home inventory while dealing with all of the paperwork associated with that. You’re just reinforcing the point I’m attempting to make that this is something to complete now on your own terms, rather than being forced to complete one due to a tragic/stressful life circumstance. Thanks for stopping by! I can see this is a great tool. Some years ago I had a house fire and lost everything but the clothes on my back. Of course being in shock I couldn’t remember all that I had when it came time to deal with an insurance claim. I can see the importance of this product. Thanks for such an informative post. Something to look into for sure. Have a great day. I’m so sorry to hear about your house fire Donna. Unfortunately, I know many others who experienced this situation, and ALL of them wished that they had better prepared for it. That was my impetus for putting together the Organizing for Emergency series here on the blog. Thanks for your comments! Thanks for stopping by. I’m glad you found the post useful! Great and thorough post about Homezada. I have been doing an inventory for 20 years now and it is time consuming. It’s great they put it all I one place. I think that is why not many people do it. I will definitely share with my clients. Thanks for sharing. Yes, I can’t lie…it is a time-consuming process, the FIRST time you do it. 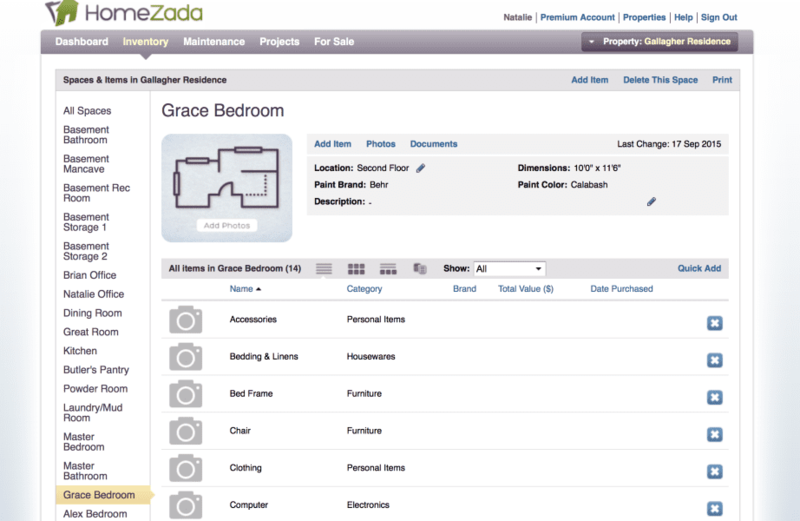 But now that it’s completed, the year-to-year maintenance is easy when you use Homezada. I’m glad you found the post valuable and thanks in advance for sharing! I like the idea of an app for this. Many years ago, when my husband was out of work, he took the time to do up a detailed home inventory, which then got filed away and forgotten. The next time we looked at it, we found not only that we’d acquired many new items, but that we no longer owned a lot of the ones included on the inventory. Using Home Zada would make it more fun (for those of us who enjoy technology) and easier to maintain as well.